3, 69.9% Fe), goethite (FeO(OH), 62.9% Fe), limonite (FeO(OH)·n(H2O), 55% Fe) or siderite (FeCO3, 48.2% Fe). Metallic iron is virtually unknown on the surface of the Earth except as iron-nickel alloys from meteorites and very rare forms of deep mantle xenoliths. Although iron is the fourth most abundant element in the Earth's crust, comprising about 5%, the vast majority is bound in silicate or more rarely carbonate minerals (for more information, see iron cycle). The thermodynamic barriers to separating pure iron from these minerals are formidable and energy intensive, therefore all sources of iron used by human industry exploit comparatively rarer iron oxide minerals, primarily hematite. 2.1 billion year old rock showing banded iron formation. Processed taconite pellets with reddish surface oxidation as used in the steelmaking industry, with a US Quarter (diameter: 24 mm (0.96 in)) shown for scale. Banded iron formations (BIFs) are sedimentary rocks containing more than 15% iron composed predominantly of thinly bedded iron minerals and silica (as quartz). Banded iron formations occur exclusively in Precambrian rocks, and are commonly weakly to intensely metamorphosed. 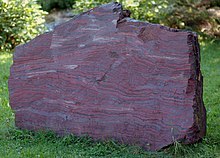 Banded iron formations may contain iron in carbonates ( siderite or ankerite) or silicates ( minnesotaite, greenalite, or grunerite), but in those mined as iron ores, oxides ( magnetite or hematite) are the principal iron mineral. Banded iron formations are known as taconite within North America. The mining involves moving tremendous amounts of ore and waste. The waste comes in two forms, non-ore bedrock in the mine ( overburden or interburden locally known as mullock), and unwanted minerals which are an intrinsic part of the ore rock itself ( gangue). The mullock is mined and piled in waste dumps, and the gangue is separated during the beneficiation process and is removed as tailings. Taconite tailings are mostly the mineral quartz, which is chemically inert. This material is stored in large, regulated water settling ponds. The key economic parameters for magnetite ore being economic are the crystallinity of the magnetite, the grade of the iron within the banded iron formation host rock, and the contaminant elements which exist within the magnetite concentrate. The size and strip ratio of most magnetite resources is irrelevant as a banded iron formation can be hundreds of meters thick, extend hundreds of kilometers along strike, and can easily come to more than three billion or more tonnes of contained ore. The typical grade of iron at which a magnetite-bearing banded iron formation becomes economic is roughly 25% iron, which can generally yield a 33% to 40% recovery of magnetite by weight, to produce a concentrate grading in excess of 64% iron by weight. The typical magnetite iron-ore concentrate has less than 0.1% phosphorus, 3–7% silica and less than 3% aluminium. Currently magnetite iron ore is mined in Minnesota and Michigan in the U.S., Eastern Canada and Northern Sweden. Magnetite bearing banded iron formation is currently mined extensively in Brazil, which exports significant quantities to Asia, and there is a nascent and large magnetite iron-ore industry in Australia. 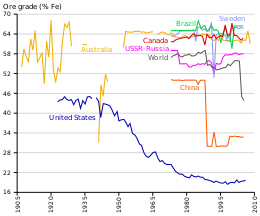 Direct-shipping iron-ore (DSO) deposits (typically composed of hematite) are currently exploited on all continents except Antarctica, with the largest intensity in South America, Australia and Asia. Most large hematite iron-ore deposits are sourced from altered banded iron formations and rarely igneous accumulations. Occasionally granite and ultrapotassic igneous rocks segregate magnetite crystals and form masses of magnetite suitable for economic concentration. A few iron ore deposits, notably in Chile, are formed from volcanic flows containing significant accumulations of magnetite phenocrysts. Chilean magnetite iron ore deposits within the Atacama Desert have also formed alluvial accumulations of magnetite in streams leading from these volcanic formations. Some magnetite skarn and hydrothermal deposits have been worked in the past as high-grade iron ore deposits requiring little beneficiation. There are several granite-associated deposits of this nature in Malaysia and Indonesia. Other sources of magnetite iron ore include metamorphic accumulations of massive magnetite ore such as at Savage River, Tasmania, formed by shearing of ophiolite ultramafics. 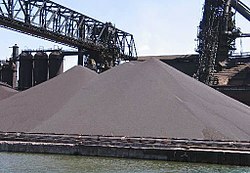 The Lower-grade sources of iron ore generally require beneficiation, using techniques like crushing, milling, gravity or heavy media separation, screening, and silica froth flotation to improve the concentration of the ore and remove impurities. The results, high quality fine ore powders, are known as fines. Magnetite is magnetic, and hence easily separated from the gangue minerals and capable of producing a high-grade concentrate with very low levels of impurities. The grain size of the magnetite and its degree of commingling with the silica groundmass determine the grind size to which the rock must be comminuted to enable efficient magnetic separation to provide a high purity magnetite concentrate. This determines the energy inputs required to run a milling operation. Generally most magnetite banded iron formation deposits must be ground to between 32 and 45 micrometers in order to produce a low-silica magnetite concentrate. Magnetite concentrate grades are generally in excess of 70% iron by weight and usually are low phosphorus, low aluminium, low titanium and low silica and demand a premium price. Due to the high density of hematite relative to associated silicate gangue, hematite beneficiation usually involves a combination of beneficiation techniques. For a more comprehensive list, see list of countries by iron ore production. Iron is the world's most commonly used metal - steel, of which iron ore is the key ingredient, representing almost 95% of all metal used per year. It is used primarily in structural engineering applications and in maritime purposes, automobiles, and general industrial applications (machinery). Iron-rich rocks are common worldwide, but ore-grade commercial mining operations are dominated by the countries listed in the table aside. The major constraint to economics for iron ore deposits is not necessarily the grade or size of the deposits, because it is not particularly hard to geologically prove enough tonnage of the rocks exist. The main constraint is the position of the iron ore relative to market, the cost of rail infrastructure to get it to market and the energy cost required to do so. Mining iron ore is a high volume low margin business, as the value of iron is significantly lower than base metals. It is highly capital intensive, and requires significant investment in infrastructure such as rail in order to transport the ore from the mine to a freight ship. For these reasons, iron ore production is concentrated in the hands of a few major players. World production averages two billion metric tons of raw ore annually. The world's largest producer of iron ore is the Brazilian mining corporation Vale, followed by Anglo-Australian companies Rio Tinto Group and then BHP Billiton. A further Australian supplier, Fortescue Metals Group Ltd, has helped bring Australia's production to first in the world. In Australia iron ore is won from three main sources: pisolite " channel iron deposit" ore derived by mechanical erosion of primary banded-iron formations and accumulated in alluvial channels such as at Pannawonica, Western Australia; and the dominant metasomatically-altered banded iron formation related ores such as at Newman, the Chichester Range, the Hamersley Range and Koolyanobbing, Western Australia. Other types of ore are coming to the fore recently, such as oxidised ferruginous hardcaps, for instance laterite iron ore deposits near Lake Argyle in Western Australia. The total recoverable reserves of iron ore in India are about 9,602 million tonnes of hematite and 3,408 million tonnes of magnetite. Chhattisgarh, Madhya Pradesh, Karnataka, Jharkhand, Odisha, Goa, Maharashtra, Andhra Pradesh, Kerala, Rajasthan and Tamil Nadu are the principal Indian producers of iron ore. World consumption of iron ore grows 10% per annum[ citation needed] on average with the main consumers being China, Japan, Korea, the United States and the European Union. China is currently the largest consumer of iron ore, which translates to be the world's largest steel producing country. It is also the largest importer, buying 52% of the seaborne trade in iron ore in 2004. China is followed by Japan and Korea, which consume a significant amount of raw iron ore and metallurgical coal. In 2006, China produced 588 million tons of iron ore, with an annual growth of 38%. In recent years, however, this benchmark system has begun to break down, with participants along both demand and supply chains calling for a shift to short term pricing. Given that most other commodities already have a mature market-based pricing system, it is natural for iron ore to follow suit. To answer increasing market demands for more transparent pricing, a number of financial exchanges and/or clearing houses around the world have offered iron ore swaps clearing. The CME group, SGX (Singapore Exchange), London Clearing House (LCH.Clearnet), NOS Group and ICEX (Indian Commodities Exchange) all offer cleared swaps based on The Steel Index's (TSI) iron ore transaction data. The CME also offers a Platts-based swap, in addition to their TSI swap clearing. The ICE (Intercontinental Exchange) offers a Platts-based swap clearing service also. The swaps market has grown quickly, with liquidity clustering around TSI's pricing. By April 2011, over US$5.5 billion worth of iron ore swaps have been cleared basis TSI prices. By August 2012, in excess of one million tonnes of swaps trading per day was taking place regularly, basis TSI. A relatively new development has also been the introduction of iron ore options, in addition to swaps. The CME group has been the venue most utilised for clearing of options written against TSI, with open interest at over 12,000 lots in August 2012. Geoscience Australia calculates that the country's "economic demonstrated resources" of iron currently amount to 24 gigatonnes, or 24 billion tonnes. [ citation needed] The current production rate from the Pilbara region of Western Australia is approximately 430 million tonnes a year and rising. Gavin Mudd (Monash University) and Jonathon Law (CSIRO) expect it to be gone within 30 to 50 years (Mudd) and 56 years (Law). These estimates require on-going review to take into account shifting demand for lower grade iron ore and improving mining and recovery techniques (allowing deeper mining below the groundwater table). In 2011, leading Pilbara-based iron ore miners – Rio Tinto, BHP Billiton and Fortescue Metals Group (FMG) – all announced significant capital investment in the development of existing and new mines and associated infrastructure (rail and port). Collectively this would amount to the production of 1,000 million tonnes per year (Mt/y) by 2020. Practically that would require a doubling of production capacity from a current[ when?] production level of 470 Mt/y to 1,000 Mt/y (an increase of 530 Mt/y). These figures are based on the current[ when?] production rates of Rio 300 Mt/y, BHP 240 Mt/y, FMG 55 Mt/y and Other 15 Mt/y increasing to Rio 360 Mt/y, BHP 356 Mt/y, FMG 155 Mt/y and Other 140 Mt/y (the latter 140 Mt/y is based on planned production from recent[ when?] industry entrants Hancock, Atlas and Brockman through Port Hedland and API and others through the proposed Port of Anketell). In March 2014, Fortescue officially opened its 40 million-tonne per annum (mtpa) Kings Valley project, marking the completion of a US$9.2 billion expansion that increased its production capacity to 155 mtpa. The expansion included the construction of the greenfields Solomon Hub in the Hamersley Ranges, one of the world's largest iron ore developments comprising Kings Valley and the nearby 20 mtpa Firetail mine; an expansion of the Christmas Creek mine to 50 mtpa; and major extensions of Fortescue's world-class port and rail facilities. A 1,000 Mt/y production rate needs to be further considered by proponents and government. Areas of further consideration include new port space at Anketell to service the West Pilbara mines, growth at Port Hedland (BHP has announced the development of an outer harbour at Port Hedland), rail rationalisation and the regulatory approval requirements for opening and maintaining a ground disturbance footprint that supports 1,000 Mt/y of production including, amongst other things, native title, aboriginal heritage and environmental protection outcomes. Iron ores consist of oxygen and iron atoms bonded together into molecules. To convert it to metallic iron it must be smelted or sent through a direct reduction process to remove the oxygen. Oxygen-iron bonds are strong, and to remove the iron from the oxygen, a stronger elemental bond must be presented to attach to the oxygen. Carbon is used because the strength of a carbon-oxygen bond is greater than that of the iron-oxygen bond, at high temperatures. Thus, the iron ore must be powdered and mixed with coke, to be burnt in the smelting process. Carbon monoxide (CO) is the principal reduction agent. The inclusion of even small amounts of some elements can have profound effects on the behavioral characteristics of a batch of iron or the operation of a smelter. These effects can be both good and bad, some catastrophically bad. Some chemicals are deliberately added such as flux which makes a blast furnace more efficient. Others are added because they make the iron more fluid, harder, or give it some other desirable quality. The choice of ore, fuel, and flux determine how the slag behaves and the operational characteristics of the iron produced. Ideally iron ore contains only iron and oxygen. In reality this is rarely the case. Typically, iron ore contains a host of elements which are often unwanted in modern steel. 2) is almost always present in iron ore. Most of it is slagged off during the smelting process. At temperatures above 1300 °C some will be reduced and form an alloy with the iron. The hotter the furnace, the more silicon will be present in the iron. It is not uncommon to find up to 1.5% Si in European cast iron from the 16th to 18th centuries. The major effect of silicon is to promote the formation of grey iron. Grey iron is less brittle and easier to finish than white iron. It is preferred for casting purposes for this reason. Turner (1900, pp. 192–197) reported that silicon also reduces shrinkage and the formation of blowholes, lowering the number of bad castings. Phosphorus (P) has four major effects on iron: increased hardness and strength, lower solidus temperature, increased fluidity, and cold shortness. Depending on the use intended for the iron, these effects are either good or bad. Bog ore often has a high phosphorus content ( Gordon 1996, p. 57). The strength and hardness of iron increases with the concentration of phosphorus. 0.05% phosphorus in wrought iron makes it as hard as medium carbon steel. High phosphorus iron can also be hardened by cold hammering. The hardening effect is true for any concentration of phosphorus. The more phosphorus, the harder the iron becomes and the more it can be hardened by hammering. Modern steel makers can increase hardness by as much as 30%, without sacrificing shock resistance by maintaining phosphorus levels between 0.07 and 0.12%. It also increases the depth of hardening due to quenching, but at the same time also decreases the solubility of carbon in iron at high temperatures. This would decrease its usefulness in making blister steel (cementation), where the speed and amount of carbon absorption is the overriding consideration. The addition of phosphorus has a down side. At concentrations higher than 0.2% iron becomes increasingly cold short, or brittle at low temperatures. Cold short is especially important for bar iron. Although bar iron is usually worked hot, its uses[ example needed] often require it to be tough, bendable, and resistant to shock at room temperature. A nail that shattered when hit with a hammer or a carriage wheel that broke when it hit a rock would not sell well. [ citation needed] High enough concentrations of phosphorus render any iron unusable ( Rostoker & Bronson 1990, p. 22). The effects of cold shortness are magnified by temperature. Thus, a piece of iron that is perfectly serviceable in summer, might become extremely brittle in winter. There is some evidence that during the Middle Ages the very wealthy may have had a high phosphorus sword for summer and a low phosphorus sword for winter ( Rostoker & Bronson 1990, p. 22). Careful control of phosphorus can be of great benefit in casting operations. Phosphorus depresses the liquidus temperature, allowing the iron to remain molten for longer and increases fluidity. The addition of 1% can double the distance molten iron will flow ( Rostoker & Bronson 1990, p. 22). The maximum effect, about 500 °C, is achieved at a concentration of 10.2% ( Rostocker & Bronson 1990, p. 194). For foundry work Turner[ who?] felt the ideal iron had 0.2–0.55% phosphorus. The resulting iron filled molds with fewer voids and also shrank less. In the 19th century some producers of decorative cast iron used iron with up to 5% phosphorus. The extreme fluidity allowed them to make very complex and delicate castings. But, they could not be weight bearing, as they had no strength ( Turner 1900, pp. 202–204). There are two remedies[ according to whom?] for high phosphorus iron. The oldest, and easiest, is avoidance. If the iron that the ore produced was cold short, one[ who?] would search for a new source of iron ore. The second method involves oxidizing the phosphorus during the fining process by adding iron oxide. This technique is usually associated with puddling in the 19th century, and may not have been understood earlier. For instance Isaac Zane, the owner of Marlboro Iron Works did not appear to know about it in 1772. Given Zane's reputation[ according to whom?] for keeping abreast of the latest developments, the technique was probably unknown to the ironmasters of Virginia and Pennsylvania. Phosphorus is a deleterious contaminant because it makes steel brittle, even at concentrations of as little as 0.6%. Phosphorus cannot be easily removed by fluxing or smelting, and so iron ores must generally be low in phosphorus to begin with. Small amounts of aluminium (Al) are present in many ores including iron ore, sand and some limestones. The former can be removed by washing the ore prior to smelting. Until the introduction of brick lined furnaces, the amount of aluminium contamination was small enough that it did not have an effect on either the iron or slag. However, when brick began to be used for hearths and the interior of blast furnaces, the amount of aluminium contamination increased dramatically. This was due to the erosion of the furnace lining by the liquid slag. Aluminium is difficult to reduce. As a result, aluminium contamination of the iron is not a problem. However, it does increase the viscosity of the slag ( Kato & Minowa 1969, p. 37 and Rosenqvist 1983, p. 311). This will have a number of adverse effects on furnace operation. The thicker slag will slow the descent of the charge, prolonging the process. High aluminium will also make it more difficult to tap off the liquid slag. At the extreme this could lead to a frozen furnace. There are a number of solutions to a high aluminium slag. The first is avoidance; don't use ore or a lime source with a high aluminium content. Increasing the ratio of lime flux will decrease the viscosity ( Rosenqvist 1983, p. 311). Sulfur (S) is a frequent contaminant in coal. It is also present in small quantities in many ores, but can be removed by calcining. Sulfur dissolves readily in both liquid and solid iron at the temperatures present in iron smelting. The effects of even small amounts of sulfur are immediate and serious. They were one of the first worked out by iron makers. Sulfur causes iron to be red or hot short ( Gordon 1996, p. 7). Hot short iron is brittle when hot. This was a serious problem as most iron used during the 17th and 18th century was bar or wrought iron. Wrought iron is shaped by repeated blows with a hammer while hot. A piece of hot short iron will crack if worked with a hammer. When a piece of hot iron or steel cracks the exposed surface immediately oxidizes. This layer of oxide prevents the mending of the crack by welding. Large cracks cause the iron or steel to break up. Smaller cracks can cause the object to fail during use. The degree of hot shortness is in direct proportion to the amount of sulfur present. Today iron with over 0.03% sulfur is avoided. Hot short iron can be worked, but it has to be worked at low temperatures. Working at lower temperatures requires more physical effort from the smith or forgeman. The metal must be struck more often and harder to achieve the same result. A mildly sulfur contaminated bar can be worked, but it requires a great deal more time and effort. In cast iron sulfur promotes the formation of white iron. As little as 0.5% can counteract the effects of slow cooling and a high silicon content ( Rostoker & Bronson 1990, p. 21). White cast iron is more brittle, but also harder. It is generally avoided, because it is difficult to work, except in China where high sulfur cast iron, some as high as 0.57%, made with coal and coke, was used to make bells and chimes ( Rostoker, Bronson & Dvorak 1984, p. 760). According to Turner (1900, pp. 200), good foundry iron should have less than 0.15% sulfur. In the rest of the world a high sulfur cast iron can be used for making castings, but will make poor wrought iron. There are a number of remedies for sulfur contamination. The first, and the one most used in historic and prehistoric operations, is avoidance. Coal was not used in Europe (unlike China) as a fuel for smelting because it contains sulfur and therefore causes hot short iron. If an ore resulted in hot short metal, ironmasters looked for another ore. When mineral coal was first used in European blast furnaces in 1709 (or perhaps earlier), it was coked. Only with the introduction of hot blast from 1829 was raw coal used. 2), though a common iron mineral, has not been used as an ore for the production of iron metal. Natural weathering was also used in Sweden. The same process, at geological speed, results in the gossan limonite ores. The importance attached to low sulfur iron is demonstrated by the consistently higher prices paid for the iron of Sweden, Russia, and Spain from the 16th to 18th centuries. Today sulfur is no longer a problem. The modern remedy is the addition of manganese. But, the operator must know how much sulfur is in the iron because at least five times as much manganese must be added to neutralize it. Some historic irons display manganese levels, but most are well below the level needed to neutralize sulfur ( Rostoker & Bronson 1990, p. 21). Sulfide inclusion as manganese sulfide (MnS) can also be the cause of severe pitting corrosion problems in low-grade stainless steel such as AISI 304 steel. Under oxidizing conditions and in the presence of moisture, when sulfide oxidizes it produces thiosulfate anions as intermediate species and because thiosulfate anion has a higher equivalent electromobility than chloride anion due to its double negative electrical charge, it promotes the pit growth. Indeed, the positive electrical charges born by Fe2+ cations released in solution by Fe oxidation on the anodic zone inside the pit must be quickly compensated / neutralised by negative charges brought by the electrokinetic migration of anions in the capillary pit. Some of the electrochemical processes occurring in a capillary pit are the same than these encountered in capillary electrophoresis. Higher the anion electrokinetic migration rate, higher the rate of pitting corrosion. Electrokinetic transport of ions inside the pit can be the rate limiting step in the pit growth rate. ^ "IRON ORE - Hematite, Magnetite & Taconite". Mineral Information Institute. Archived from the original on 17 April 2006. Retrieved 7 April 2006. ^ Harry Klemic, Harold L. James, and G. Donald Eberlein, (1973) "Iron," in United States Mineral Resources, US Geological Survey, Professional Paper 820, p.298-299. ^ a b c d e Li, Chao; Sun, Henghu; Bai, Jing; Li, Longtu. "Innovative methodology for comprehensive utilization of iron ore tailings: Part 1. The recovery of iron from iron ore tailings using magnetic separation after magnetizing roasting". www.sciencedirect.com. Retrieved 2019-02-16. ^ Sirkeci, A. A.; Gül, A.; Bulut, G.; Arslan, F.; Onal, G.; Yuce, A. E. (April 2006). "RECOVERY OF Co, Ni, AND Cu FROM THE TAILINGS OF DIVRIGI IRON ORE CONCENTRATOR". Mineral Processing and Extractive Metallurgy Review. 27 (2): 131–141. doi: 10.1080/08827500600563343. ISSN 0882-7508. ^ "ScienceDirect". www.sciencedirect.com. Retrieved 2019-02-16. ^ Gzogyan, T. N.; Gubin, S. L.; Gzogyan, S. R.; Mel’nikova, N. D. (2005-11-01). "Iron losses in processing tailings". Journal of Mining Science. 41 (6): 583–587. doi: 10.1007/s10913-006-0022-y. ISSN 1573-8736. ^ Uwadiale, G. G. O. O.; Whewell, R. J. (1988-10-01). "Effect of temperature on magnetizing reduction of agbaja iron ore". Metallurgical Transactions B. 19 (5): 731–735. doi: 10.1007/BF02650192. ISSN 1543-1916. ^ Stephens, F. M.; Langston, Benny; Richardson, A. C. (1953-06-01). "The Reduction-Oxidation Process For the Treatment of Taconites". JOM. 5 (6): 780–785. doi: 10.1007/BF03397539. ISSN 1543-1851. ^ "Mineral Commodity Summaries 2017" (PDF). U.S. Geological Survey. Retrieved 2017-08-21. ^ "Global iron ore production data; Clarification of reporting from the USGS" (PDF). U.S. Geological Survey. Retrieved 2017-08-21. ^ Qazi, Shabir Ahmad; Qazi, Navaid Shabir (1 January 2008). "Natural Resource Conservation and Environment Management". APH Publishing. Retrieved 12 November 2016 – via Google Books. ^ "The Steel Index > News & Events > Press Studio > 2 February 2011: Record volume of iron ore swaps cleared in January". Archived from the original on 22 May 2011. Retrieved 12 November 2016. ^ "SMX to list world's first index based iron ore futures". 29 September 2010. Retrieved 12 November 2016. ^ "ICE Futures Singapore - Futures Exchange". Retrieved 12 November 2016. ^ Pincock, Stephen (July 14, 2010). "Iron Ore Country". ABC Science. Retrieved 2012-11-28. ^ "Fortescue opens Kings Valley project and celebrates completion of 155 MTPA expansion" (PDF). FMG. March 28, 2014. Archived from the original (PDF) on December 31, 2014. Retrieved 2014-12-31. ^ "QR National evaluates independent rail line for Pilbara". QR National. April 26, 2012. Archived from the original on December 30, 2012. Retrieved 2012-11-28. ^ Stockwell, Stephen (November 22, 2012). "QR's Pilbara rail plan on track". ABC Rural News. Retrieved 2012-11-28. ^ a b c d e "USGS Minerals Information: Iron Ore". minerals.usgs.gov. Retrieved 2019-02-16. ^ a b Canada, Natural Resources (2018-01-23). "Iron ore facts". www.nrcan.gc.ca. Retrieved 2019-02-16. ^ "Brazil Iron Ore Exports: By Port". www.ceicdata.com. Retrieved 2019-02-16. ^ Stewart, J.; Williams, D.E. (1992). "The initiation of pitting corrosion on austenitic stainless steel: on the role and importance of sulphide inclusions". Corrosion Science. 33 (3): 457–474. doi: 10.1016/0010-938X(92)90074-D. ISSN 0010-938X. ^ Williams, David E.; Kilburn, Matt R.; Cliff, John; Waterhouse, Geoffrey I.N. (2010). "Composition changes around sulphide inclusions in stainless steels, and implications for the initiation of pitting corrosion". Corrosion Science. 52 (11): 3702–3716. doi: 10.1016/j.corsci.2010.07.021. ISSN 0010-938X. ^ Newman, R. C.; Isaacs, H. S.; Alman, B. (1982). "Effects of sulfur compounds on the pitting behavior of type 304 stainless steel in near-neutral chloride solutions". Corrosion. 38 (5): 261–265. doi: 10.5006/1.3577348. ISSN 0010-9312. Wikimedia Commons has media related to Iron ores.